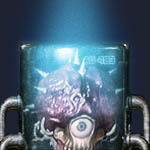 Previously unknown, it is now known that Metroids do molt their skin to better suit their growing bodies. The Alpha Metroid is the first of these forms. 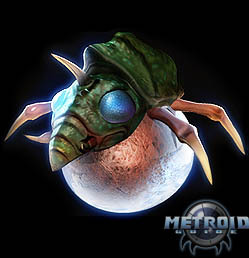 Alpha Metroids are known as the "drones" of the metroid society. Unlike drones of other hive societies though, Alpha Metroids are totally independent in their thinking, but can act as one if need be. Through their first molting, they seem to grow a quad set of eyes right on their outer shell. These eyes are multifaceted, enabling them to see in many shades of light, and even beyond into inferred and ultra-violet spectrums. Two sets of "arm" appendages also sprout from the rib cavity, enabling them to manipulate their environment. Two hard-blustered plates also appear on their back, giving added protection for their brain cavity, located now on their underside or "belly". The outer and inner fangs have also changed. The small inner fangs fallout to make room for the growing outer fangs, which now turn to tusks, which are used to spear prey and to draw the into it's inner maw. A third tusk also begins to grow on top of it's back as sort of a ramming device to clear passage ways and for also use as a defensive weapon. This is the fourth step in the metroid life cycle. 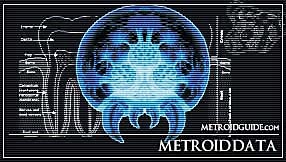 Unknown elements in the ecosystem of SR388 will cause the Metroid to molt and become a Metroid Gamma after an unknown set time.